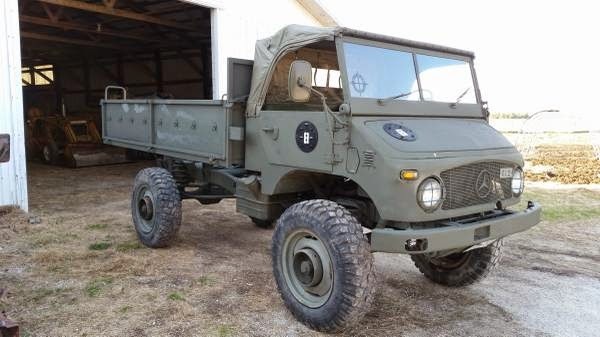 This offroad truck from German produced by Mercedes-Benz, as the picture is Unimog 404 model was released in 1967 good condition looking for new owner. 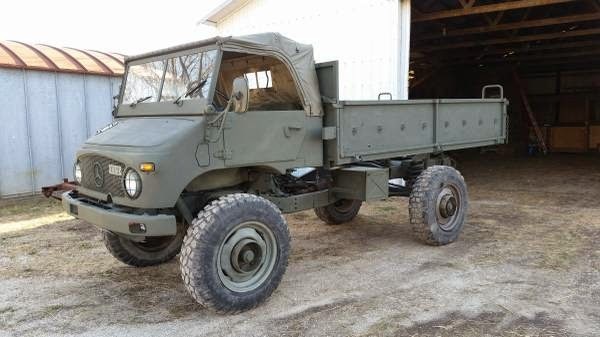 Clean and updated 1967 Unimog 404 just $10,000! You can't find a good running Unimog WITH A TITLE for a price like that! It currently has the flatbed on it but comes with the enclosed Radio Communications box with all the cabinets and even the original chairs!!! For a price I'll swap the radio body back on. If you aren't familiar with Unimogs, check out YouTube, the crawler gear and locking differentials make these things almost unstoppable. This thing looks and runs great and I have done major upgrades including the Pertronix electronic ignition, 24 volt alternator, 12 volt converter for accessories, high intensity LED lights, O2 sensor and gauge, rebuilt carb, single fuel tank with an electric fuel pump and much more!!! It has the Belgian Army flatbed with the fold down sides, with the canopy (needs wood bed floor, just 1x6 lumber) but it also comes with the rare and expensive radio body (like a camper) that's in great shape. The convertible top is new and looks great. I also have a TON of spare parts that go with it including a spare motor. There's easily a few thousand dollars in parts included. New parts are all available online from Expedition Imports so its easy to maintain these and keep them on the road. There's far too much to try to list, if you are serious, let me know. This is a very nice Unimog, you won't be disappointed. It's titled and plated, there's no special licence required. Check Ebay, this truck is 5 to 10 grand less than all the others! I'm also interested in full or partial trades, what ya got?